GRAND CANYON WEST, Arizona (CNN) -- I was stranded in the Arizona desert in my broken-down truck wondering if I had made a big mistake: Our CNN.com biofuel road trip seemed doomed to fail. 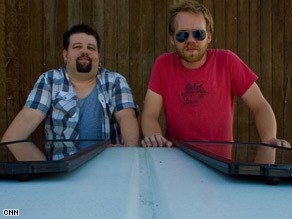 CNN.com's Cody McCloy, left, and co-pilot Brian Hardy set out on their biofuel experiment on July 28. My newly purchased 1978 International Harvester Scout quit on me during our very unscientific experiment to drive a biodiesel-powered truck from California to Georgia in two-weeks. Under a hot sun, with no air conditioning in the truck, I feared that my Scout would be stolen while I went for help. Worse, I worried that I'd be forced to abandon the vehicle altogether and return home to Atlanta with my tail between my legs. Lesson 1: The project was designed to start a conversation about alternative fuel. No single fuel is the answer, but we need to start looking at alternatives. Biodiesel's not the only solution, but it's a way to start looking at the problem of how to fuel the nation in a cleaner way, and to do something about it. Biodiesel is made by chemically modifying vegetable oil. The resulting biodiesel is nontoxic, biodegradable and can be blended at any level with regular diesel. Most diesel cars can run on it, and it can be found in more and more places around the country. The whole idea of this adventure was to see how easy it is to find biodiesel fuel and to learn what role it might play in our nation's energy future. As the price of oil spiked this year, many Americans started looking for alternative fuels that might pollute less and help the nation break its addiction to foreign oil. What is biofuel and why do we care? Driving through the Southwestern United States in August in a truck without air conditioning was an ordeal, to say the least. Much of the trip was spent with windows rolled down. The Scout sometimes blew hot air inside the truck onto our feet. On one occasion the heat was so unbearable I had to beg Brian, who was driving at the time, to pull off the Interstate and find a convenience store so we could simply stand in the refreshing a/c. Lesson 2: For long distance trips, you really need to map out your biodiesel fueling destinations and make sure they're open, and I would call places before you stop. Being green isn't necessarily easy, but if you put time into it and think about it, running your vehicle with biodiesel is something you can do to help the environmental problems we face. The number of fueling stations that offer biodiesel is growing quickly, according to the U.S. Department of Energy, but it turned out to be harder to find than we initially expected. We got a lot of help finding fueling stations from the friendly folks at the National Biodiesel Board. Reality first set in the day we set off from San Francisco on July 28. A station in Big Oak Flat, California, where we'd hoped to fill up was closed. In Las Vegas, Nevada, Haycock Petroleum provided us with biodiesel, although they normally deal only wholesale. We estimate we spent an extra five hours traveling off the beaten path in search of the right type of fuel. As for money, we shelled out $367 for fuel. The best bargain we found was $4.25 per gallon, and the most expensive biodiesel we bought was $5.59 per gallon. We bought 81.39 gallons of biofuel during the trip. When we had no choice, we bought regular diesel fuel, which totaled 74.67 gallons. Based on our research of biodiesel hurdles, the mechanical problems we had along the way were fairly typical. That said, this is a 30-year-old vehicle we're talking about, so our experiences likely differ from those you'd get in a newer car. B100 » (100 percent biodiesel) is a strong solvent, so it can soften and/or dissolve residue left from using conventional diesel fuel, according to the Department of Energy. On top of that, biodiesel breaks down certain types of rubber found in hoses and gaskets, says the DOE. The agency recommends cleaning the fuel tank if it contains residue and using "extreme care ... to ensure that any part of the fuel system that touches the fuel is compatible with B100." Unfortunately, we did not take these steps early enough. In Grand Canyon West, six days and 1,200 miles into the trip, our fuel filter clogged up and our tank contents were contaminated. Apparently a previous owner of the Scout installed fuel lines with pliable plastic tubing. Biodiesel turned this into gunk, which entered the fuel filter. Incidentally, auto manufacturers don't warranty engines after they've used blends containing more than 5 percent biodiesel, according to FuelEconomy.gov. Enough about the tough moments; this was a fun and educational trip! Brian and I met some truly forward-thinking people who are on a quest to develop more sustainable practices in the United States. We thought we might camp more during this trip, but for logistical reasons, it didn't happen as much as we expected. We camped in Yosemite National Park and New Orleans. When you're on a time-crunch, camping doesn't work and it's not necessarily any cheaper than staying at a motel. It's been a true adventure -- two-weeks I'm sure Brian and I will never forget. Thanks to everyone who helped us and who offered support as they followed us along the way. CNN's Debra Alban contributed to this report.